Last week, we asked you to name the worst airport terminal in the United States. 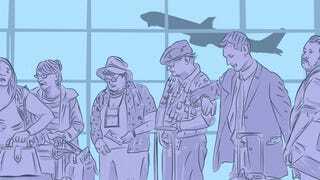 You, dear readers, rose to the occasion with incredible aplomb, dishing out horrific tales of protracted layovers, TSA foibles, and security line poopers. Nearly 600 of your commented on our story, the vast majority of you opting to name an entire airport instead of a specific terminal. So in our follow up, we've separated the wheat from the chaff—or swept the crumbs from the pleather seat of 25E—and created a simple poll with the top nine answers from last week's chatroom. Vote below, and more importantly, debate below. This is as far as you can get from empirical, and that's the point: We want to hear the most brutal cuts, the most inspired defenses, and the most hilarious stories. We'll announce the "winner" at the end of the week.